Roy H (More Than Ready), a back-to-back winner of the GI Breeders’ Cup Sprint and a heavy favorite to become the first horse to earn consecutive champion sprinter honors since Housebuster (1990-91) in Hallandale later next week, ran to his 1-5 odds to successfully defend his Palos Verdes title here. He sat a tracking third as they blazed the way through an opening quarter in :21.44. The 7-year-old set his sights on the leader as jockey Paco Lopez took a look in rearview mirror on the far turn, gained command without being asked as they straightened for home and was on cruise control down the lane to win for fun. A close third in last year’s G1 Dubai Golden Shaheen, the Peter Miller trainee is expected to return to Meydan this March. 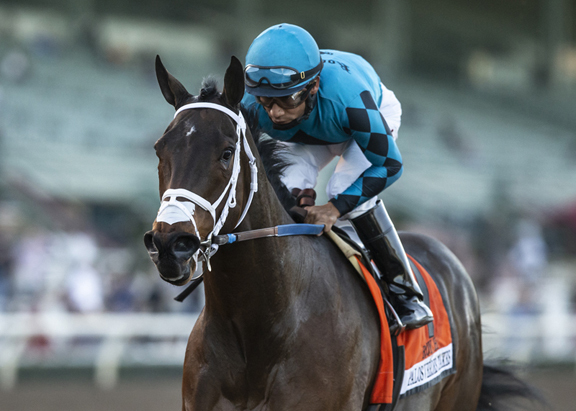 His 2018 campaign also included a second-place finish in the GI Bing Crosby S. in late July and a win in the GI Santa Anita Sprint Championship S. in October. Roy H is out of a mare who did her best work at sprint distances, winning the GIII Las Cienegas H. and GIII Railbird S. while finishing third in the GI La Brea S. Elusive Diva is a half-sister to Tropics (Speightstown), a Group 3 winner and twice runner-up in the prestigious G1 Darley July Cup. Second dam Taj Aire is also responsible for MSW R. Baggio (Chimes Band) and SW Handyman Bill (Skywalker). A $110,000 Keeneland September yearling turned $310,000 Keeneland April 2-Year-Old, Roy H is kin to the unraced 3-year-old filly Vinca (Oxbow) and a 2-year-old colt by English Channel. Elusive Diva, who was purchased for $75,000 by Calumet Farm in foal to Algorithms at Keeneland November in 2013, was most recently bred to Mr. Z.
PALOS VERDES S.-GII, $200,351, Santa Anita, 1-19, 4yo/up, 6f, 1:08.89, gd. ($115,000 Ylg ’13 KEESEP; $310,000 2yo ’14 KEEAPR). O-Rockingham Ranch & David A Bernsen LLC; B-Ramona S.
LLC (KY); T-Jerry Hollendorfer. $40,000. Schwabe Thoroughbreds (ON); T-Peter Miller. $24,000. Margins: 4, 1HF, 1 1/4. Odds: 0.30, 6.10, 14.00. Also Ran: Awesome Anywhere, St. Joe Bay, Touched by Autism. Scratched: Distinctive B.